I just can’t help it. Normally I wouldn’t get into this mood until we were solidly in September. But it’s just been so mild here these last days of August that my mind is thinking about the turning of the leaves from green to blazing Autumn displays. A nip in the air when you open the door in the morning. The lightest frost on your windshield when you first start the car. And all the pumpkin flavored treats that will linger with us all the way through the holidays. But the best pumpkin treat ever made is pumpkin pie. I will not take any suggestions of contenders for that title. Pumpkin pie is the best- end of discussion. 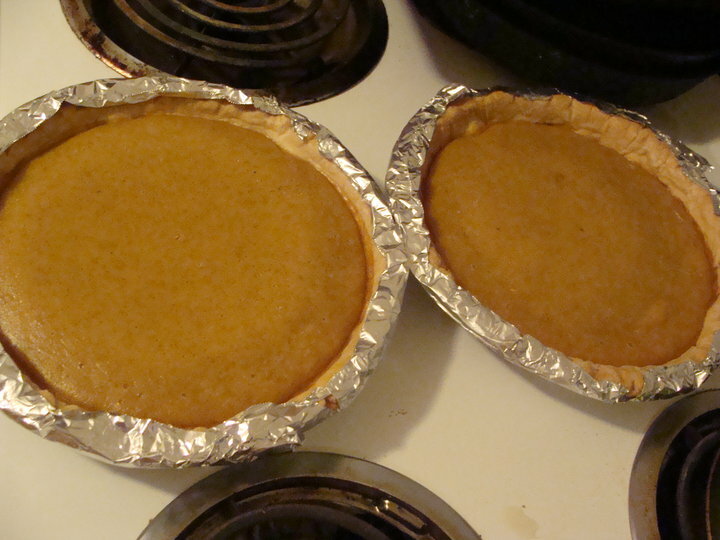 Or more specifically, The pumpkin pie I make is the best pumpkin treat ever. And I’ll tell you why. I skip the canned pumpkin and go straight for the whole pumpkins. Just like the chicken stock, it is more labor intensive then going with canned. But it’s worth it. I buy a few pie pumpkins from the produce store or the nearest pumpkin patch. Most pumpkin patches have the larger pumpkins meant for jack-o-lantern craving though, so you want to make sure what you’re buying is a pie pumpkin. You can use the larger pumpkins to make the purée you need for the pie filling, but they aren’t grown for that purpose and tend to be almost completely tasteless. Just to clarify, pie pumpkins are usually smaller (you could hold it in the palm of one hand,) denser with a medium to darker orange coloring of the skin. Some common varieties of pie pumpkin include Sugar Pie, Winter Luxury, Deep Red and Golden Cushaw. Sugar Pie is usually the only type I can find out here. I did grow my own pumpkins one year, but I haven’t been keeping up with my gardening so much since then. of pumpkins that one year. Anyway, if you want to go the fresh pumpkin route, you’ll need to quarter your pumpkin, remove all the seeds and strings and place it skin side down in a casserole dish with about an inch of water. Place the casserole in the oven at 350 degrees for one hour or until the flesh is tender. Once cool, spoon the flesh off the skin and throw into a food processor. Blend the pumpkin flesh until thoroughly puréed. The results should look like baby food. A one pound pumpkin should give you about two cups of purée. And that’s just about enough for one pie. What a coincidence! This is the recipe I use for my pumpkin pie, with one tweak. Instead of evaporated milk, I use sweetened condensed milk. Yes, the filling is more runny than the original recipe. But I take it from regular pie to almost a custard pie. And if I were to try to do it any other way, my husband would never forgive me. He loves it, and it wouldn’t be Thanksgiving or Halloween or just Autumn if I didn’t make it. And since we’re using his recipe anyway, you should totally check out 8legged.com. There you can follow the culinary adventures of Tako The Octopus, a celebrity chef who hosts his own show- Deep Fried Live. True, he’s an octopus and thus has to stay in a bucket of water at all times, but we won’t hold that against him. Mostly because he also puts a lot of stock in what Alton Brown has to say and because it’s a cleverly animated and fun little show. The pumpkin flan show is where I learned about the pumpkin pie recipe. Watch it and tell me you are not entertained. I dare you. I will only eat pumpkin pie made from Libby’s Pumpkin Pie recipe on the back of the can of Libby’s Pumpkin pie. Isn’t that funny? All other pumpkin pie’s just don’t have the right flavor/texture as the one I’m used to. Which stinks because I LOVE PUMPKIN PIE and could easily eat two whole ones in a week. But I just hate pumpkin pie from stores… and restaurants… just not the same. I have to make it myself.